Many have asked how I got into bartering. It wasn’t intentional, typically I would be too nervous to ask, but becoming a single mom make me a bit more fierce on behalf of my kids. It started a little over five years ago. I was having such trouble with my son (the twins were not in the picture yet.) He was stubborn and inquisitive and determined like no one I’ve ever met, and this was at 4 years old! The owner and Princess and Little Gymnast soon after they started. 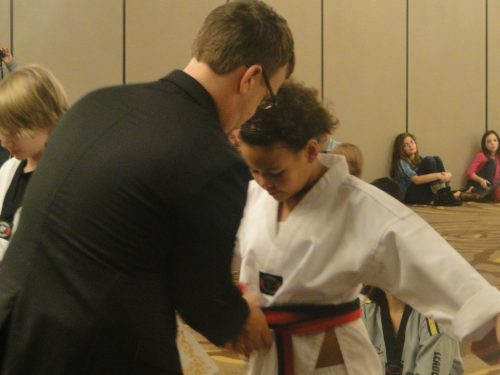 I was seeking help, and stumbled up martial arts as a sport of discipline. 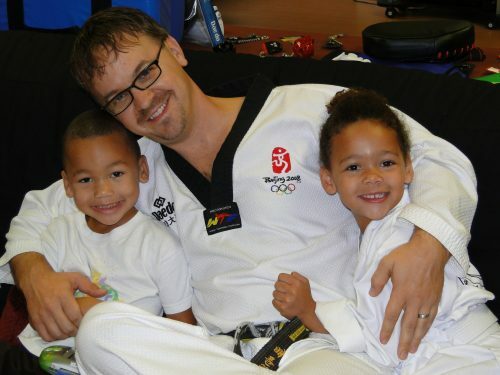 So I started calling around and visiting martial arts schools with him in tow. Most wouldn’t touch him, he was just generally too young for their programs, but one school would – Baeplex Family Martial Arts. I had explained a little bit of the situation as I set up the appointment to bring him in to try a class. We walked in the door and I felt at home. The instructors were personable, high energy and super attentive to the kids. We walked out of there with both kids signed up for a trial month. We could go as often as our schedule allowed, the classes were just the right length that I could sit and wait or even run out and do a quick errand (that was like manna to this single mom’s ears,) and the price for the month was perfect, something I felt I could keep up. Now keep in mind, I was only finding this for my son, but my daughter had a month until her dance classes started, so I did the trial month for both, figuring that the Princess would quit after the month and go into dance. Needless to say…at the end of that month, she BEGGED to continue. And there I was meeting with the owner of the studio, anticipating paying for one child on an ongoing basis and seeing that it was really my daughter who wanted this. I was in tears…and felt I had no choice but to ask. The owner of the studio tying on her new black belt after 3 hours of testing. I would never have had the courage to suggest it without the needs and wants of my kids bolstering me. And now five years later, I don’t hesitate to ask/offer. I figure the worst they can say is no, and it’s opened up so many doors for my children to experience things that they never would have been able to without it. So my suggestion…ASK…the worst they can say is no, but I think you will find many are willing to work with you! Just today I sent an email to a new sport my daughter is trying to offer web design or registration form design services in exchange for participation or summer camp, etc. whatever they might need. Crossing my fingers that it might work out. 1) I want to send my sister a small gift every month to help out their young family- I’m thinking a $25 gift card to Baby’s R Us. I’m going to contribute $25 a month into a 529 plan for my nephew. 2) $50-$100 in misc money to use if and when I want to go have some fun with friends, family and/or GF. Looking for some input on this one- too high/too little? I’m still fighting an internal battle between paying off my student loans as fast as humanly possible and not alienating everybody in life while I do so, so I’m hoping this is a stepping stone to finding a balance between the 2 options. To be completely honest- it’s a little unnerving to see my my debt reduction schedule slip a couple a months, but it should all be worth it after it’s all said and done. And for some more honestly- I never thought I’d see myself in this position. After years of reading debt blogs, I’ve been determined to do what so many seem to struggle to do (cut theirs expenses) that I swung all the way to the opposite side of the spectrum that I’m hurting myself in much different ways than financial. Like so many said last week- I need to find balance, and this is my (attempt at a) solution to it. Edit (Because I just thought of this story): This isn’t actually the most determined I’ve been to get out of debt. Back in September, despite already working 50-55 hours a week, I sent out a bunch of resumes for part-time work. I got an interview to deliver pizzas at night and on weekends for a local pizzeria. I was upfront with them and told them I was only looking for a job to help get out of debt while I worked full-time. Thankfully (THANKFULLY!) I never got a call back. I stopped pursuing part-time work after this interview. I couldn’t imagine how out of balance my work/life situation would be had I worked part-time over the winter. Two words come to mind- not. good. There’s something I want to do that are not budget related- I want to start talking with my friends and family more. 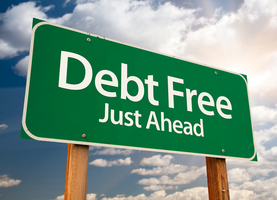 I’ve been in rut for some years while paying off debt that I would love to get out of, hopefully completely out of, by time I’m debt free. A lot of you told me to give my time vs. going out and I thought that was a great idea, and that is what I’m going to strive to do, a little bit at a time. There’s quite a few people I haven’t touched base with in years, so it’s going to take some effort and patience as I don’t see this being an overnight deal. I’m going to re-start my contributions into my companies 401K plan! I have my sights set on 4% of my income which will allow me to get the maximum match (they match .5% for every 1% up to 2%). Even though I’m not currently in the company plan, the company gives 2% in profit sharing to every employee regardless of their contribution status. I don’t feel right about missing out on the 4% I could be saving and the 2% in match now that I’m passed the 50% marker in debt payoff. On Monday 3/30, my girlfriend turned the big 2-7!!! So…this meant birthday plans and birthday gifts. Taking a page from her handbook from my birthday celebration (see here), I made a goody bag of all her favorite things and I baked her a cake! I NEVER bake, and as you can see by the results, the effort was there, but the skill, unfortunately, was not. LOL. But I have to say- she loved it! Maybe not the cake, so much, but the time and effort I put in to making it. And she also loved her goody bag, which was filled with things I’ve remembered over the years that she loves: grape tomatoes, Tim Horton’s gift card ($5), a gift card for pop at the corner store ($5), salted popcorn, salsa, various varieties of salt. 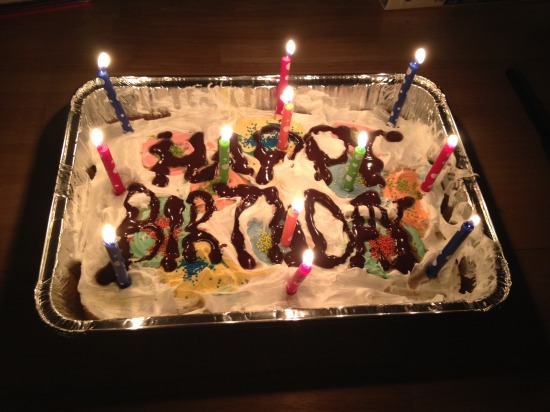 Overall, it cost me about $70, including the all the ingredients to make the cake (which were also in her bag). I also gave her a bunch of “love” coupons- for back rubs, uninterrupted naps, a night in with a movie of her choice, etc… which was her favorite part of the day! In previous years, I’ve bought flowers, chocolates, spa gift certificates as birthday gifts but this year I got the best response. I’m so glad I was able to make her birthday really special this year. Since my last update 2 weeks ago, I’ve been able to bring my total on Sallie Mae 05 down $1,100.